This innovative multi award winning formulation will change the way you see facial tanners. Created for oily and acne prone skin, this gradual tanning water will give you a lovely sun-kissed glow without clogging pores, at the same time feeding and hydrating the skin. Nothing says healthy skin better than a gorgeous sun-kissed glow, but some tanning lotions can be too heavy for oily and combination skin leaving skin looking greasy rather than glowing! 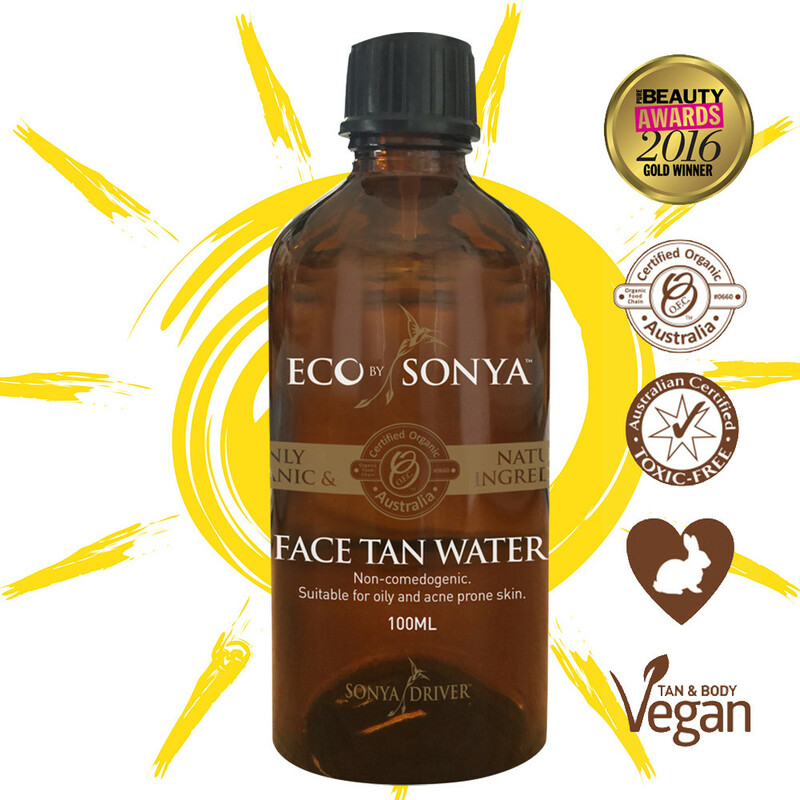 Eco by Sonya Organic Face Tan Water is the world’s first tanning water using wholly natural and organic ingredients. Apply this lightweight non-comedogenic formula as you would a toner, to hydrate, brighten and even out skin tone. The depth of tan builds with each application, so you can tailor it to your desired glow. This nourishing water is created using a blend of Aloe Vera, Orange Peel and Rose Geranium, and is free from synthetic fragrances, parabens & GMOs - zero harmful chemicals or toxins. Skin Type: Perfect for oily and blemished skin and all skin tones. Application: Apply tan evenly into clean, dry skin, using circular motion either with a cotton pad or fingertips. Take your time and ensure to cover all areas including under the eyes and blending into the hairline. Wash hands thoroughly after application. For best results allow tan to develop for at least 8 hours before showering and ensure to exfoliate at least 24 hours prior to application. Repeat application over consecutive nights to build to your desired depth of tan. No need to apply a moisturiser after use. Tip: Use as a toner 2 to 3 times a week to achieve a natural glow. Matching Products: Use Eco by Sonya Extreme Exfoliant Glove prior to application to achieve long-lasting results.